Well there's good news and there's . . . . actually there is no good news so what am I going on about. Start again . . . .
Well there's bad news and even badder news. 'Directors Cut' - OUT NOW, honest, it is, look it is I tell you. I mean, come on, what ever next, a 'Directors Re-Shoot'. Just look at the new cover, wow, Im blown away. That banner makes a huge differance. Anyway, here's more info and how to be bribed to buy it. WARNING - The following link does contain a image of the 'new' cover and details on how to purchase the DVD. Please do not use link if your easily offended or have a nervous disposition. The cover looks good. I still havent gotten the original release yet. 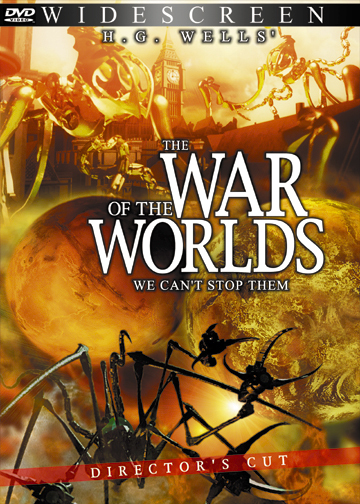 -Pendragon's War of the Worlds: Director's Cut. "You see, after carefulyy going over the first film, we realised what was wrong with it: Timothy Hines. So, once we cut out the director, the film suddenly became 24% less lethal when exposed to human subjects. From there, we went through the usual editing process and got it down to something that's safe to watch in 10-minute bursts without suffering permanent neural damage..."
I have made an alternative cover for the DVD. If anybody actually buys this, I would suggest printing this one and shoving it in the case in place of the legitimate one. I made it a link in case this forum is sensitive to naughty words. Even though this air of negativity is somewhat frightening, I found that rather amusing! that was very funny. Sums it all up, in one soundbite. Yes, What air of negativity? we already know Pendragons effort is a heap of cr*p and this is the best thing that could happen to it, at least we are enjoying it a bit more.